One day I'll get to all the Fukushima ramen shops. One long on my list has been Fukushima Ichimen, a basement shop with a large menu. When I entered I was recommended the seafood shio ramen, whose ingredients change when they feel like it. On my visit firefly squid happened to be one of the primary ingredients. 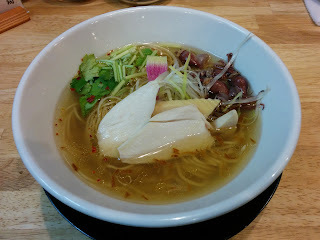 The toppings were unusual, but the underlying base was a simple shio, light with a sheen of oil. The noodles were thin but not slurpable in a way that welcomed chewing. Of course the main event was the firefly squid topping, which was bitter in the way squid organs often are, with a nice chew to it. I wasn't head over heels over the bowl, but I suppose I'll show up again as Fukushima Ichimen often appears on stamp rallies. This is one for those who like the weird. Shio ramen with truffle oil was quite good. Also there are good nihonshu that suits with ramen. The bad thing is the staff is too much polite for a ramen shop.